Brexit presents the European Union with profound challenges. But by returning more benefits to ordinary citizens, promoting the many advantages of a common market with a GDP of $13.4 trillion, and luring more financial services firms away from the U.K. — along with some additional steps — the 27-country bloc could create a new age of growth, according to this opinion piece by Kalin Anev Janse (@kaanev), the secretary general and also a member of the management board of the European Stability Mechanism (@esm_press), or ESM, the eurozone’s lender of last resort. Can Europe benefit from Brexit? Absolutely yes. In today’s world, choosing to be part of something big is most definitely more advantageous than opting for smallness and isolation. Europe is the most successful economic, trade, and financial collaboration among 28 countries in history. Over recent decades, the cooperation among these countries has not only ensured peace in a continent torn for centuries by wars, but it has also proved to be the most thriving wealth creation project the world has ever seen. Though I am very sad that the British people have decided to leave, it will create one heck of an opportunity for the rest of Europe. Disconnecting from a large economic powerhouse hurts, and it can hurt a lot. The wave of globalization since the 1970s has intertwined many economies. The most thriving are those that have opened themselves up (like South Korea and Singapore.) The European Union has been the most far-reaching project in economic integration ever — bringing together 28 countries. Its crown jewel is the European single market: ensuring free movement of goods, capital, services, and people. These four freedoms have allowed for unprecedented standardization, ranging from food (e.g. British jam can be sold across Europe without the need to comply with 27 different regulations) to labor (e.g. Dutch farmers employ south-eastern Europeans to harvest crops, jobs the Dutch typically don’t want to do). Giving up these freedoms will be harmful, much more for the U.K. than for any other part of the world (figure 2). Countries that have disengaged from the world in recent decades have all suffered. In March 2015, the U.K. won a landmark Court of Justice of the European Union case against the European Central Bank regarding the clearing of euro-denominated securities and derivatives. It is a huge business, with the value of daily transaction turnover exceeding $1 trillion. Though the U.K. does not use the euro as a currency, the court upheld its privileges to clear the euro because it is part of the EU. Leaving the EU could therefore not only mean losing the business itself, but the ecosystem around the business, which often follows. A U.K. exit might also limit the ability of London-based clearing banks to execute derivatives transactions with EU clients if the country fails to maintain the EU passport for financial services. 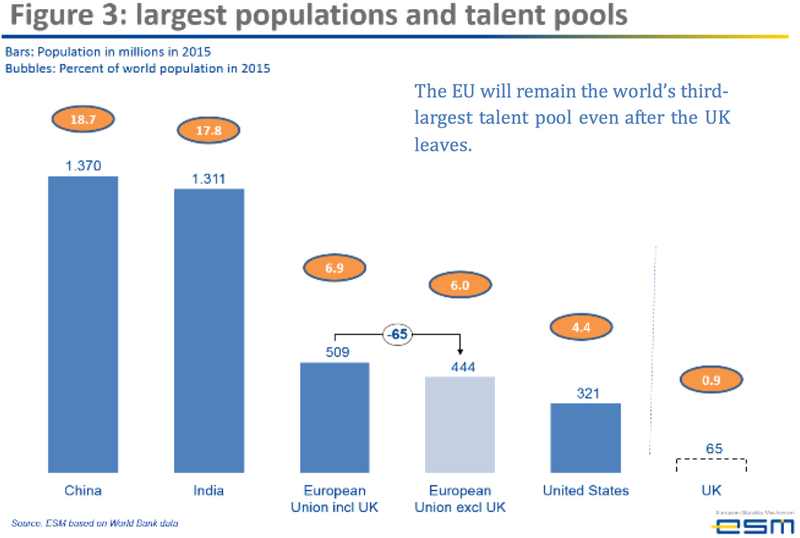 The single market of 444 million EU citizens will remain strong, while the UK’s talent pool will shrink to 65 million (figure 3). UK-based financial institutions and other international corporations will very soon feel the burdens of this: the uncertainty around the employment rights of current EU citizens in the U.K.; the future difficulty in recruiting EU citizens for U.K. operations; and the potential expansion of a points-based immigration system to cover EU nationals. Boost the single market – but shift the focus to direct benefits for people…. Focus on common regulation … that benefit EU citizens directly, such as abolishing [telecom] roaming costs. Examples of this are not hard to find. When I graduated from business school, I applied to investment banks in New York. It was like a childhood dream. With an EU citizenship, they all diverted me to their London or Frankfurt branches. Why? Because U.S. visa requirements, even for highly skilled workers, pose a significant recruitment burden. In the same spirit, for international banks based in the U.K., it will be much easier to recruit in Frankfurt or Paris than to go through a lengthy, uncertain, and potentially expensive recruitment process. And the devil will be in the details. EU employees might vote with their feet if their personal situation worsens. In any case, they will face new uncertainties. Post-exit, will the U.K. continue to allow, as the EU does, that its citizens move pension rights across countries? Will young Europeans who move to London continue to be able to bring over their partners, as they could under EU family reunification rules? The hostile environment towards Eastern Europeans doesn’t help either. In the end, the final question many may ask themselves is, “Why bother?” Choosing certainty may become the best solution. Many multinationals and other financial institutions could easily decide to move headquarters to continental Europe, retain access to the 444 million people in the talent pool, and keep the benefits a free and open labor market offers. This explains why a large number of London-based corporations are touring Frankfurt, Paris, Amsterdam, Dublin and even Luxembourg in search of better alternatives, thus proving that Brexit forms an immense opportunity for the rest of Europe. Uncertainty is never good for long-term capital investments. Large corporations (like Japanese car manufacturer Toyota) are re-examining investments in the U.K. Why build a new factory wing, if the export tariffs to the EU are uncertain? If World Trade Organisation rules were to apply, an extra entry tariff of 10% would be added onto car prices making them a tenth more expensive to export from the U.K to EU countries. Better to assemble them in continental Europe instead and retain the benefits of the highly lucrative EU single market. Such a shift is not difficult, since the rest of the EU offers a number of good alternatives. The Chinese are leading the way. They opened a ‘Great Wall’ car assembly line in Bulgaria a few years ago. Some diversion of investments is already taking place. Amid a surge in redemption requests after the vote, U.K. property funds halted exchange trading and some suspended the redemptions. The U.S.-based fund Marathon, with $13 billion in assets, shifted investments to Frankfurt, Paris and other EU cities anticipating that many U.K banking services jobs will be moving abroad. And again, the devil is in the details. Not only will the U.K. lose access to a number of EU investment-stimulating programs, such as: the European Investment Bank (EIB, $33 billion in U.K. project finance investment 2011–2015); the Juncker investment plan; structural funds; and agricultural support for poorer areas. The U.K. will lose its biggest investor in venture capital (and potential start-ups): the European Investment Fund. The fund committed $2.5 billion to 144 U.K. venture firms between 2011 and 2015. This amounts to a whopping 37% of all venture funding raised in the U.K. over that period. The Luxembourg-based EIB will not disappear, but it will redirect its investments to venture capital and start-ups in the rest of Europe. Some beneficiaries will simply follow the money. Make it very attractive for banks and corporates to relocate from the U.K. to EU-27. They will benefit from the single market, a huge talent pool and aligned legislation. 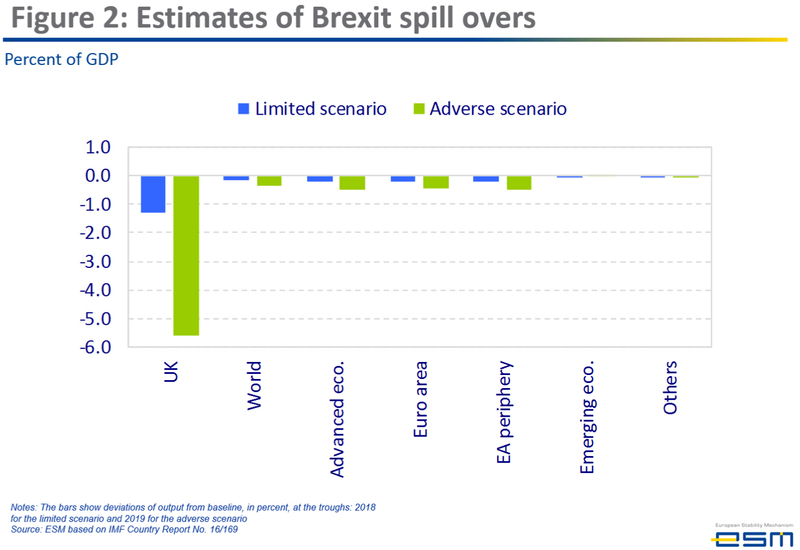 Whether, when and how Britain will trigger the EU leaving clause, Article 50, as well as the content of the final trade agreement with the EU, only add to uncertainty and create further risk. Indeed, the various reflections in Scotland, Northern Irelands and Gibraltar on whether to leave the EU together with the U.K., or instead leave the U.K. and stay within the EU, as well as the prevailing hostility towards foreigners, will further discourage investors. Obviously many questions remain to be answered regarding Brexit and the effects on the U.K., but it nevertheless offers an opportunity for the remaining 27 countries of the EU, with a huge potential up for grabs. Big is beautiful — promote it: Use the firepower of the world’s second-largest economy with $13.4 trillion GDP and third-largest talent pool with 444 million highly skilled and educated citizens. Promote the size, benefits and strength of this powerhouse. It is a tremendous benefit to be able to tap such a market for companies, but also a unique opportunity for citizens to find jobs across the continent. In global trade deals, sheer size matters a lot. For citizens, there are many benefits to be protected by a larger union when they venture abroad (e.g. disaster repatriation by any EU embassy around the world, support by any EU consulate and strong EU passenger rights for flying in- and outside the EU). Boost the single market – but shift the focus to direct benefits for people: Deepen the highly lucrative single market, but revise the approach. Focus on common regulation and standardisation that benefits EU citizens directly: abolishing roaming costs, common digital licences (e.g. for services like Netflix, Apple store and online TV) and equal treatment of modern services (like Uber, Airbnb and online retailers.) Netflix has different offerings in every country (some more than others), watching national TV outside home territory is sometimes difficult (e.g. Dutch soccer team games from Italy) and Uber thrives in some cities (Amsterdam) but is banned in others (Luxembourg.) Creating a truly deep integrated common market focused on citizens’ benefits will boost the support, make it easier for companies to offer services and allow it to thrive and prosper. Smart integration — do things that could not be done before: The U.K. was never a fan of the euro or certain integration initiatives, including Schengen (where 26 European countries have done away with passport and certain other border monitoring). It tried to block many decisions in the past, all for its own benefit: from the banking union to harmonization in taxation. Now such initiatives can go faster and be done better. Many of them will have benefits for EU citizens. Banking union ensures safer banks, common deposit guarantee scheme ensures secure saving accounts up to $112,000 across Europe and tax harmonization avoids a race to the bottom, which harms citizens. The integration needs to be smart, Europe’s political developments show that citizens want to be closer to decision-making. And they are right. So the subsidiarity principle must apply even stronger. If decisions can be taken regionally, they must (e.g. urban development, social care and housing.). If issues are cross-border (like security, financial services and trade), they should be lifted to European level. Some matters don’t stop at regional or national borders; we must work on them together. Bring over banks, corporates and the ecosystem – make it appealing to move: Make it very attractive for banks and corporates to relocate from the U.K. to EU-27. They will benefit from the single market, a huge talent pool and aligned legislation. Investment banks will have the certainty that they will be able to serve all EU-27 countries with one passport without restrictions, car manufacturers will continue to be able to sell any EU-produced car to any EU customer against zero import tariffs, and lawyers, consultants and support services (“the ecosystem”) will still to be able to recruit any EU citizen without any constraint, bureaucratic administration or work visa. EU hubs (like Frankfurt, Paris, Amsterdam or Luxembourg) should make it truly attractive to shift: offer infrastructure (e.g. space for office buildings), ensure sufficient housing permits (e.g. high-end housing for bankers and hedge fund managers) and improve transportation (e.g. allow major airports to extend their flight connections). It must really appealing to relocate, without burdensome procedures and stimulated by strong incentives (like taxation benefits for highly skilled expats). Leverage investment opportunities – follow the money: Promote how venture capital, start-ups and corporates benefit from an EU-27 location. They would keep access to the European Investment Fund (largest VC investor in Europe), EU innovation programs and the European Investment Bank (including the 350 billion euro stimulus package, proposed to be increased to $700 billion by EU Commission President Juncker in the “State-of-the-Union” in September 2016. 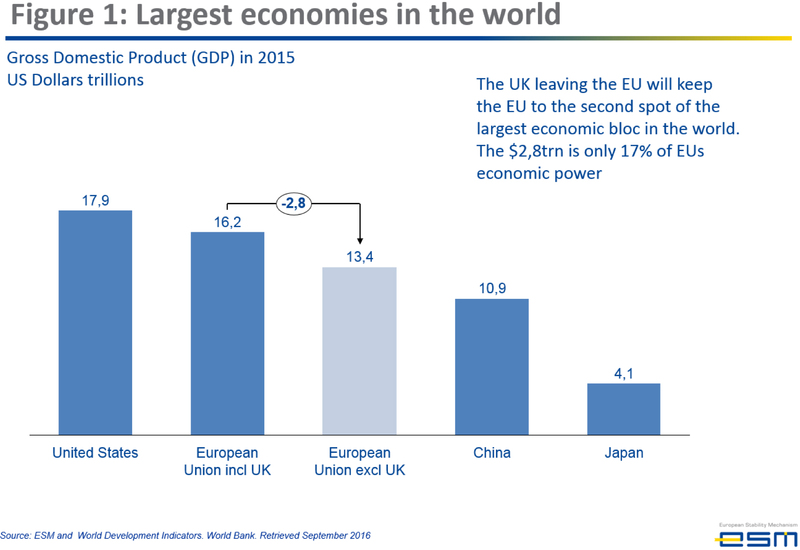 The EU is home to some of the fastest-growing economies in the developed world — from Spain (GDP growth of 3.2% in 2015) to Ireland (GDP growth of 7.8% in 2015 (revised to a whopping 26.3% because of patent and profit reallocations). Following the money, financial streams and the next wave of growth is attractive to investors. Attract the leaders of tomorrow – EU-27 as the place to be: Asian, South American and African financial institutions, corporates and investors are opening more and more European operations. Many of them need to take the decision where to base their regional headquarters, European trading rooms and newly built plants. The long-term perspective is key in such a decision. Choosing the EU-27 as the main base gives all the certainty they need. EU-27 leaders, city-promotion agencies and chamber of commerce chiefs should travel to fast growing markets and attract the headquarters of the leaders to tomorrow. Some of the fastest growing Asian financial institutions are already diverting investments from London to continental Europe. Why take the risk? Make it appealing for skilled workers to move back. There are more than three million EU citizens working in the U.K. Many come from Southern or Eastern Europe. Some of these countries could use the labor force, creative new ideas and further boost of market growth (for example, Bulgaria). Make it appealing for skilled workers to return and counter the brain-drain. Italy had a great program to attract back young Italian young bankers from the U.K. by offering them tax breaks for the first years after they return. This can serve as a model for other Eastern and South European countries. Finally, it is all about trust, stability and the reduction of uncertainty. At the end, whether it is people that are taking long-term life decisions or companies mobilizing investments, they all are looking for trust, stability and long-term certainty. There is a lot of certainty within the EU-27, but a lot of uncertainty regarding the U.K. The “worst” that can happen to the EU-27 is that the current deal between the EU and U.K. remains, but there is a huge upside potential with many possible benefits. So going “long” EU-27 and “short” U.K. is the wisest risk management decision. Everything above creates one heck of an opportunity for Europe. And it is up for grabs. All it takes is for four or five of the largest banks to decide on one of Europe’s cities and move their investment bank and trading desk. The rest of the ecosystem: the consultants, lawyers and other service providers will follow rapidly, and so will corporations. The question is: Who is brave, bold and ambitious enough to start? ¹Austria, Belgium, Bulgaria, Croatia, Cyprus, Czech Republic, Denmark, Estonia, Finland, France, Germany, Greece, Hungary, Ireland, Italy, Latvia, Lithuania, Luxembourg, Malta, Netherlands, Poland, Portugal, Romania, Slovakia, Slovenia, Spain and Sweden. Unless eurozone leaders reverse economic policies – or take measures such as creating two or more separate euro currency zones -- the region faces more economic stagnation and widening political divisions, says Nobel Laureate Joseph Stiglitz. It does amuse me when ‘intellectuals’ expend so much energy on hot air on Brexit, effectively missing the real points again & again. All so very logical & sequential at first glance – yet totally ill conceived. Just like the 95% of economists who wrongly predicted the short term negative effects of Brexit. You also appear to be self-prejudiced & unfortunately more or less blinded by your own bias. 2) The food offers a wider choice than anywhere else – yes too many Belgian waffles aren’t a good thing! 3) London speaks English as its first language. 4) Bankers’ families can enjoy the best education in the world – all taught in English naturally. Not a redundant ‘world’ language like German, French or Dutch. 5) The English legal system is perhaps the most respected in the world – pretty crucial as a basis for a global financial centre I’d proffer. Of course several major US banks could relocate to Germany. But the food really is crap – (unless you are genetically related to the cabbage or potato or of course). On the other hand in Paris the food is superb – but your waiter will be so bloody rude, you’ll not fancy eating there for long! In case you’re wondering what the hell does all this really have to do with economics or business reasoning, here’s your answer. Along with those, actually very important points above, post Brexit London is to deregulate on a signature scale. So what will transpire is that almost on the banks of Europe (forgive the pun) will evolve the worlds most competitive, deregulated off shore financial centre ever conceived. Sure the city of London will change, but don’t believe for one minute the direction of travel will be diminishing in its axis. So one last thought – it is simply the EU who needs to evolve & reform now & not the UK………. Hell0 – I don’t think readers of this should take much notice of this article – sorry. I am from England and this article is a bit skewed – it doesn’t really give the true picture. The words ‘ hot air wind bag’ come to mind. I wouldn’t want students of public policy to think the above article is of any relevance and correct in any way. This is one of the best papers Knowledge@Warton has ever published. The author is surely a world-class public sector manager. I agree with all he writes. The British chose to go away ? Good riddance. Now we can totally ignore the floods of nonsense coming from British people such as the above James Walsh, HM and Matt Wood. By the way: I am writing this in Paris (France, not Texas), where I have been in charge of the national economic development policies for the Île-de-France (Paris) region for twelve years, before working as a development consultant. For me, Brexit has become about self-determination through elected officials. It’s called democracy. I sincerely hope for Emilio’s sake that a Frexit does not happen, for if it does, he will have to say ‘good riddance’ to himself. Or move to Brussels in order to preserve the EU’s Four Freedoms ideology. They are simply ideas and are not sacrosanct, except when it suits. Better still, move to Beauvais for an education! I much prefer the ideals Fraternity, Equality and Liberty. Vive La France! Democracy ? Elected officials ? What use are british elected membes of the House of Commons, as they were and will not asked to approve Brexit ? Referenda are a just a parody of democracy. Moreover (unfortunately) all almost member of the European commission have elected and have been cabinet ministers in their own countries, and have been designated by elected nationals governments. Four freedoms are not ideology: they are the worging bases of the working of any developed economyEgalité and Fraternité are just for the façades of public buildings. Frexit is not in sight. French people will not be asked another silly question soon. Yes Emilio, I too would be very surprised if a Frexit actually happens, but stranger things have happened. Try telling Marine Le Pen! The Deutsche Banking crisis is interesting though, don’t you think? With no state bail out as decreed by Mutti, Renzi is rubbing his hands with glee waiting to see what she does, so he can re-capitalize his own banks. I expect some fudge factor will occur and whoops goes one of those four freedoms again. I expect in the long run we both want similar things, we just disagree on how that should be achieved. I personally don’t wish to live in a federalist, totalitarian state, but I respect those that do. If I’d have wanted that I would move to Russia. I wish you well Emilio in all your endeavours.